Media reports of the twenty-fifth anniversary of the democratic uprising in Myanmar have obscured a more important development. The natural gas pipeline that connects China to Bay of Bengal through Myanmar has been operationalized very recently. This is a historic development, and fulfills a cherished Chinese ambition to connect the People&’s Republic to the Indian Ocean as part of its two-ocean strategy. The Indian Ocean is critical for China, because 80 per cent of its oil imports traverse the Malacca Straits. Therefore, China is establishing a network of relationships with Indian Ocean littoral states while developing secure and diverse energy routes. The new pipeline cannot completely eliminate the Malacca Straits as a significant transit zone, but it is a part of China&’s overall strategy to reduce excessive dependence on this route. The pipeline starts at Kyaukpyu in Myanmar and terminates in Kunming in China and its completion in just three years indicates the policy consistency and determination of Beijing to ensure that its economic momentum continues to receive necessary energy resources. China is also building an oil pipeline alongside the existing gas pipeline which will begin operations next year. These two pipelines will not only carry energy resources from the gas fields in the Bay of Bengal but also transport oil from the Middle East which can be off-loaded at Kyaukpyu and conveyed to Kunming. With a capacity to deliver 22 million tons of oil and 12 billion cubic meters of natural gas each year, these pipelines are being described by China as its fourth largest strategic energy asset. The completion of this pipeline assumes even greater significance, given the fact that the Myitsone Dam, which was being constructed by Chinese companies in northern Myanmar, had to be suspended in 2011. 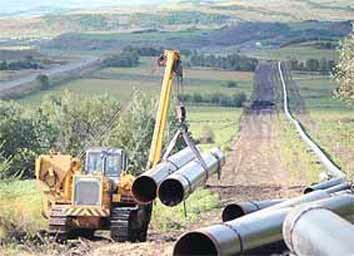 Numerous concerns were advanced against the construction of the pipeline, including environmental damage, absence of proportionate benefits to local communities and the criticism that natural gas from Myanmar&’s offshore fields was being supplied to China while the country itself was experiencing blackouts. In spite of such anxieties, the project went ahead unimpeded, clearly demonstrating China&’s continuing strong influence in Myanmar. China has been making efforts in Myanmar to improve its image through corporate social responsibility activities. For instance, Chinese media have been making the case that the pipeline companies have spent some $ 20 million for social sector development in Myanmar and made provisions for schools and health clinics. After local protests against the Chinese-backed Letpadaung copper mine project, the profit-sharing agreement was renegotiated by which the Myanmar government received a larger share of the profits and greater allocations to CSR activities were made. With this re-negotiation, it is not surprising that there are demands to re-negotiate all the Chinese projects that were signed during the previous military rule. For the Myanmar government, such re-negotiation may appear attractive not only from the perspective of equity and the necessity to achieve environmental standards, but also because it results in providing greater resources at its disposal. Given the current political transition, the availability of such additional resources would enable Naypiydaw to expand expenditure on welfare schemes without reducing the budget for institutions associated with the military. The domestic compulsions of allocating adequate resources to various political constituencies will inspire some circles within Myanmar&’s political system to press for re-negotiation of contracts with greater vigour, and such demands for re-negotiation could lead to souring the relations between Myanmar and China. With its huge investments in Myanmar, China is being compelled to take account of the ethnic conflicts in that country. Rarely do such Chinese interventions receive general approbation, and the responses to China&’s efforts to promote ethnic reconciliation have been mixed. For instance, China played a significant role in prevailing on the Myanmar government and the Kachin Independence Organisation to begin negotiations on a ceasefire agreement and the talks did result in a successful ceasefire agreement recently. However, the negotiations were delayed because China reportedly was uncomfortable with the presence of other international observers such as from the USA and UK. In the final discussions, the only international presence other than that of China itself was that of the United Nations, which did not go down well with some of the stakeholders involved. Given the Myanmarese inclination for re-negotiation of contracts and the tentative ethnic peace process, China has evinced some hesitation in making major new investments in Myanmar: it is reported that China&’s investments in Myanmar during 2012-13 declined to $407 million compared to $4.35 billion during the previous fiscal years. The Chinese experience in Myanmar underlines a lesson for new investors from other parts of the world, namely that the capacity to influence the current Myanmarese élite does not necessarily translate into sustainable business opportunity in the long-run. There are lessons in these developments for India as well. Firstly, one of the reasons for the emergence of China as a dominant player in Myanmar is because India&’s connectivity network with Myanmar is lamentably poor. As a businessman in Mandalay complained, “If I place an order with Chinese business houses, the goods will be delivered in one or two days, but if I place an order with India, it may take months.” Secondly, steps to ensure easy movement of goods across the India-Myanmar border must be initiated and the north-eastern state governments must be closely associated with such measures. Thirdly, it must be remembered that large numbers of Indians were expelled from Myanmar in the 1960s, allegedly for unethical business practices. Whatever the merits of such reasoning, the residual presence of such negative perceptions must be recognized and addressed through creative public diplomacy campaigns.